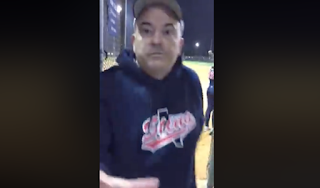 A softball coach with the Cy-Fair Texas Sting organization has been fired and charged with assault after he allegedly attacked a grandmother at a game in an incident captured on her cellphone camera. Dyess Park in Cypress, Texas. “He body slammed me. He just charged at me like a football player and he was going for my phone,” she told the Houston Chronicle. According to Houston news station KHOU, Edwards’s adult son pulled the coach off of her, and Schmidt proceeded to hit him. “He wanted to fight. He didn’t care who he was going to fight. Whether it was a 40-year-old man or a 60-year-old woman, it didn’t matter,” she told the outlet. Schmidt left the field before officers were able to respond on Saturday and a warrant had been issued for his arrest, Harris County Constable officials told the Houston Chronicle. A Harris County Constable official has confirmed to Yahoo Lifestyle that Schmidt turned himself in on Wednesday morning. Upon hearing that Schmidt would no longer serve as a coach, Edwards told KTRK, “Hallelujah! Edwards, who told the Houston Chronicle she is suffering from neck and back pain, on top of being bruised from the incident, plans to file charges. “Hopefully, somebody holds him accountable for his behavior,” she told the news outlet. Edwards wrote on Facebook that her granddaughter, who has played on her softball team for three years, has decided to leave the league. Beware of falling chocolates. Shake this blog up and candy will fall out. Random hidden codes throughout. Words may have two meanings but a picture can tell a thousand words. And yet the learned are not wise and the wise are not learned. In our own busy society we try to save time but in reality no one can save time. You can only spend time. So then the only real question is do you spend your time wisely or foolishly? Welcome to the Underground, we don't chase rabbits around, we are the Underground.